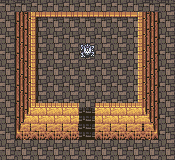 If you remember fondly the dusty corridors of the Pyramid from world three, this should feel a bit nostalgic. If you miss Omega, you’re in for a reunion. Incubi’s Path teems with Omegas. Before you suit up for random Omega battles, walk through the hidden passage to the left and pluck and Ash from the chest. Treasure boosts morale before tough battles. Don’t bother following the other hidden passage to the left. It won’t get you anywhere. When you’re not busy taking on Omega after Omega (I’m not exaggerating) you’ll meet a couple of undead monsters. I recommend wandering the halls wearing Ribbons and Angel Rings. The newest addition to the Advance only monster lineup is #238 Medusa. She likes to cast Dancehall Daze and lull your party members to sleep. She also likes to charm, petrify, and paralyze. You may also run into your old friend Necromancer who likes to zombify anything in sight—thus the Angel Rings. Dinozombies roam these halls as well. They like to poison. If you have a spare Angel Robe, it might save you from a bit of damage. You may run into Mecha Heads as well, but next to Omega, killing Mecha Head is like battling a Goblin from the beginning of the game. Speaking of Omega, if you walk forward from the room’s entrance you get a glimpse of skittering machines. These aren’t Mecha Heads. Each and every one of these is an Omega who wants nothing more than to Wave Cannon your party into oblivion. If you already defeated the Omega back in the Cave you know what to do. If you haven’t been wandering around with Read Ahead on you have most likely gained a few levels and mastered a few jobs since then. You’re stronger. Omega is not. He is exactly the same. Brush up on your Omega strategy. I am not reprinting it here. My brief recapped advice: 1. Thundaga Sword Magic 2. Flame Rings for all 3. Ribbons if you can spare them 4. Float in case of Earthquake 5. Hastega 6. Healing! Fight your way all the way north for another Advance Only treasure. The chest protected by the herd of Omegas holds the Demon’s Rod. The Demon’s Rod has the highest atk of any rod in the game. Since it is usually equipped by a spell caster, its 55 atk may be a bit lackluster. But, when you use the Demon’s Rod for bonking, it has a 20% chance of casting Death on its target. Just be careful who you whack with it since it inflicts poison-elemental damage. Its +2 to mpwr is added incentive to hoist the rod. When you are done admiring your new find walk around to the east. Ignore the northern path. Instead take the hidden passage to the east and walk south to reach another treasure chest. Pull out a soothing Elixir. It may come in handy if the Omegas have not treated your party gently. Slink back through the hidden passage. This time take the northern split and follow it to the exit. This room looks much like the one you just left. The pyramid motif will continue for a bit longer. I know it’s difficult, but ignore the hidden passage to the right. To sate your curiousity I’ll tell you what awaits you at its end: a hole in the floor. Unless you want to revisit the River of Souls do not drop through the hole. Stay focused and march north. A switch beckons from across the room. Climb onto the platform and put all your weight into the switch. Your effort is rewarded by a cut scene. The magical barrier in Abyssal Falls lifts. That cave leads to Shinryu’s Lair. You are free to run back there and slay Neo Shinryu now. I am going to wait a bit. Exit the switch room. That’s all there is in there. Just that one very important blue switch. Turn left at the fork and go around the corner. When you come to another blue switch on the wall I implore you not to touch it. You may notice the chasm to the south of it. Pressing the switch releases a wave of sand that sweeps you back to Incubi’s Path—right in the center of the swarm of Omegas. Keep walking. At the end of that path there is another switch which you may press. I didn’t mention it before, but at the western end of Incubi’s Path there was a door that you couldn’t enter (which is why I didn’t mention it). Pressing the switch opens up that door. Time to go see what’s on its other side. It’s your choice how you want to get to the door. If you killed off all of the Omegas, or if they don’t scare you, then by all means press that switch I told you to ignore. Otherwise go back the way you came in. Once you reach the western end of Incubi’s Path you will see a passage way with a strange light brown bit in the middle of it. That is a one way path. I guess it is a slide. It may come in handy later, but right now you are interested in the open door to the west. Use it. This area is full of tiny rooms along a central hidden passage. We’ll follow it around for treasures. Wander south and turn east at the end of the corridor. Enter the hidden passage. Ignore the strange little empty rooms along the path until you see a strange room with a treasure chest. Exit the passage for a moment to claim your prize: Dark Matter.. Get back in the hidden passage and walk all the way west. Turn south and take the first western fork to another chest. Open it for a Blitzshot. That is the last bit of treasure from this hidden passage. Don’t bother going any further south. Go back around the way you came. Once out of the hidden passage walk west and up around the path. When you spy the treasure chest, tread lightly. There is a pitfall in front of it. Take the Hero Cocktail from the chest. Don’t follow the path to the south. It leads to another pitful. We do want to fall down, but there’s one more treasure to get first. Sneak into the hidden passage to the west and follow it south. It dumps you out in front of another treasure. Carefully pick its lock and relieve it of its Dark Matter. Since you have relieved this room of its treasures fall down whichever pitfall suits your fancy. They both lead the same place. You have three guesses about who sits the throne in this room. It isn’t Galuf. Take the Ash from the chest next to it and ponder who you’ll face as you wander north to the next treasure. Pocket the Blitzshot. Before you find the throne room proper, you have a couple of switches to press. The switch on the left opens the door directly east. Good thing too since that is the only way out of here. A slide protudes just past the exit, so make sure you press the switch on the right before you leave. It’s a one way trip. The switch on the right opens another door in this room way over to the east. Raise your hands as you go down the slide outside the room. Turn east. Pause in front of the central door. The throne rests behind it. Maybe shudder a little for good measure before you continue to the east. Turn south at the fork for the last treasure before your encounter with the king. Take a Holy Water from the chest and then exit the room and walk north along the path. The only thing in the room at the path’s end is a switch. Press it to unlock the central door. Go back to the door and peer cautiously inside. Omega Mk.II marches on top of a dais. He won’t charge you, but waits patiently for your advance. Omega Mk.II behaves much like Omega. He uses most of the same attacks. He has permanent reflect cast on him. The biggest difference between Mk.II and his little brother is that Omega (classic) has a fixed weakness to lightning. Omega Mk.II uses a “Barrier Change” to randomly change his weakness. He alternates between weaknesses to fire, ice, and lightning. He absorbs whatever elements he is not weak to. You can either play Mk.II’s weakness guessing game or take elements out of the mix. I find it easier to avoid elemental damage altogether. I suit up for this battle with Mk.II just like I do for the battle with Omega (classic). I start off passing out Ribbons to everyone. Mk.II still likes to cause all sorts of status effects. He uses Blaster to paralyze or instantly kill. Ribbons won’t help with the paralysis, but they will keep you alive. Mk.II also likes to use Rainbow Wind. In addition to draining hp, Rainbow Wind causes darkness and silences its target. The Ribbon will protect you from those status effects. A new spell in Mk.II’s repertoire is Delta Attack. I am sure you are familiar with this petrifying attack. Once again, the Ribbon protects you from it. So. Have I stressed the Ribbon enough yet? Wear it. I know it doesn’t say “I am a hero!” quite as well as a Genji Helm, but sometimes you have to choose protection over fashion. Armor is personal preference. I haven’t found any one piece to be superior over any other. So if you have a fashion statement to make, make it with your body armor or robe. I recommend the same accessories as I did for Omega (classic): Flame Rings. Whenever you have a chance to absorb an attack rather than take damage from it, use it. In this case you can absorb (and learn if you are desperate) Mk.II’s Flame Thrower attack. As an added bonus you can absorb Atomic Ray if you’ve equipped Flame Rings or Flame Shields. Absorbing two of his attacks is not too shabby. If you can carry a shield, make it either the Flame Shield (if you don’t have a Flame Ring) or an Aegis Shield. Aegis Shields are my personal preference because of their propensity to stop spells. Mælstrom is my least favorite enemy attack. When facing strong enemies such as Omega Mk.II Mælstrom is essentially a death sentence since it reduces its target’s hp to single digits. The Aegis Shield offers a slight hope that Mælstrom misses its target and she lives to see another round of combat. Like Omega (classic), Mk.II sometimes casts Earthquake for ungodly amounts of damage. Come prepared with your party already floated or bring a blue mage capable of casting Mighty Guard. Time magic is never bad to bring to a fight, so you may want to bring one to recast float as well as to cast Hastega. That is about as prepared as defensively prepared as you can get for this battle. I have never defeated Omega Mk.II without the tin terror Encircling someone and tossing them out of the fight. Don’t worry, they come back if you beat him, but they won’t share in the 150 abp that he bequeaths (if anybody still needs the points). It sort of cramps your style to fight with one less character. Best of luck on avoiding this attack. Wave Cannon is a huge threat to the safety of your group and there is nothing to be done about it. It reduces the entire party’s maximum hp by ½ and causes hp to drain. Rocket Punch is right up with Wave Cannon in the irritating unavoidable damage department. Rocket punch reduces a single party member’s current hp by ½ and causes hp to drain. Heal as quickly as your little mage can chant. So you are all dressed up and ready to kill. Well, almost anyway. I didn’t mention what weapons you should be carrying or what classes and abilities to juggle. As far as weapons are concerned, bring the strongest enchantable weapons you’ve got. I like to use mêlée fighters with ! Spellblade. I do not relish the idea of guessing Omega’s weakness, so I enchant my blades with Flare for a little non-elemental oomph. If you want to play his game, by all means guess his weakness. Just remember he will be weak to fire, ice, or lightning and will absorb any other element. Do not hit him with holy-elemental weapons without first casting spellblade on them. They will heal him. And he heals himself rather well without your aid by casting Curaga. If you opt for enchanting your swords with Flare, you can expect to cause around 4,000 points of damage with each blow. If you decide instead to guess Mk.II’s weakness and you guess correctly you can inflict up to 9,999 points of damage making short work of the battle. It may be worth the risk. At this stage of the game, you want to use freelancers for the mêlée fighters and Mimes for your healers. I suggest either two of each or three freelancers and one mime. If you have three fighters you can enchant each fighter’s sword with a different spell and whack away with each until you find Omega’s weakness (which seems often to be fire). If you thought to bring along a summoner instead of a mêlée fighter because Bahamut has served so well in the past few fights think twice. Bahamut inflicts frustratingly little damage—less than 1,000. Your mana is better spent healing. The same goes for my brilliant idea to cast Flare on Mk.II. Well, not necessarily the same. He reflects it back on the party. In my opinion it’s setting reflect up on your party hinders healing too much to be of use. When Omega Mk.II falls you gain the Force Shield. The Force Shield is arguably the best shield in the game. The thing that makes it so great is that it renders its bearer immune to all elemental damage. It is not without its drawbacks however. It weighs a whopping 15. The heaviest shield, the Genji, weighs 6. Its evd is a measly 10%. That is the same as the very first shield you got, the Leather Shield. The Genji Shield has a 50% evd. It also decreases agi by 5. It slows its wearer down considerably. On a positive note, it increases def by 15. The Genji Shield only increases it by 9. In my opinion this is the best shield in the game because of its elemental immunities. I would gladly be slowed in order not to take damage from things like Aeroga and Firaga. Having killed Omega Mk.II, your next challenge is Neo Shinryu. You should have pressed the switch back in the Decedent’s Path removing the barrier from his cave. Backtrack out of the Tomb of Memory. You are done here. Remember to save at the consecrated circle when you get to Abyssal Falls. When you are ready, go to the cave in Abyssal Falls B2 and enter Shinryu’s Lair. Bartz- Freelancer- Mutsunokami & Ragnarok, Ribbon, Maximillian, Hermes Sandals- !Spellblade, !Rapid Fire Lenna- Mime- Gold Hairpin, Black Robe, Crystal Orb- !Dualcast,!White, !Time Krile- Freelancer- Longinus & Apocalypse, Ribbon, Power Sash, Hermes Sandals- !Spellblade, !Rapid Fire Faris- Mime- Aegis Shield, Gold Hairpin, Vishnu Vest, Protect Ring- !Dualcast, !Summon, !Revive Krile went in and did her thing with !Rapid Fire, sadly she got Encircle as a reward, Bartz used his !Rapid Fire, Faris evaded Wave Cannon, healed with Lenna, Bartz kept going at it (no !Spellblade) with lots of criticals, after the next barrage Faris was a victim to Encircle, then Bartz and Lenna pulled two more !Rapid Fire barrages together which finished him. nothing is compared to a combination of a romeo�s ballad and the all-mighty power of darkness. have every party member with hermes sandals, sages surplice & flame shield, (you can equip gold hairpins in your healer and one in your necromancer or mime with dark arts ability). you need to have a mime with sing (to cast romeos balad) & combine to use spark cannon (this will help you to guess the weakness of mkII) you will need a mime with dualcast, time and white. a mime with mix (for balms of gilead) and with blue (for flame thrower, that will also help to discover weaknesses) and at last a mime or necromancer who will be your offensive charachter. first cast romeo�s ballad, then flame thrower, it will not do much damage, but in case it isnt the weakness, it will neither heal much hp. when you see if fire isnt the weakness proceed casting deep freeze, if the weakness is fire cast meltdown. the advantage of using dark arts is that the effect is inmediate, spellblade is very slow, and you have to change the spell of the sword, and then wait a turn to begin attacking. heal as it becomes necesary. when it is your singer units turn wait around two seconds for omega mkII to recover from stop and sing again romeo�s ballad. you should do this many times until the inoffensive toy is destroyed. I killed him on my first go, WITHOUT HIM DOING ANY MOVE OTHER THAN BARRIER CHANGE! YES!! Right, I learned part of this strategy from a youtube vid, so can't take all the credit, but here's the info: Have a bard, with romeo's ballad, and a mime or another bard - keep smacking him with this every bard's turn, it temporarily stops him from attacking. To damage, don't bother with summons, Odin did a paltry 1453, and Bahamut 495... instead, I used rapid fire, spellsword (flare) and dual-wield, with Apocalypse and Ragnarok. I did over 3000 with each hit, so you can imagine it totals up. Have the bards equip Hermes Sandals, so that they can Romeo Ballad as much as possible - they must constantly keep this up. This strategy also works on normal Omegas, which is why I managed to kill him first time (first Omega battered me for weeks). Again not my strategy, so give no credit - and good luck! The easiest way to beat Omega Mk2 is to have 1 party member with apocalypse and ragnarok equipped. He should also have spellblade and rapid fire. Everyone should have hermes sandles. Your other 3 party members should also have hermes sandles and should all have the sing command. Sing romeos ballad constantly. Usually he is weak to fire first so cast firaga on your blade and rapid fire away. He literally attacked me only once the entire battle with this strategy. First of all scan omega mkII for his weakness then use !spellblade thundaga,firaga or blizzaga depending on his weakness, then with two weapons equiped, hack him to death with !rapid fire! I killed him with a single casting of Spellblade Blizzaga and a single use of Rapid Fire wielding Brave Blade and Apocalypse. Each hit did roughly 9500 damage. Hey! guess what? i defeat omega mk'II with my whole party standing! how did i do it? Just pound him with rapid fire (note! you should have the skill dual weild so that you can equip two strong weapons like apocalypes and ragnarok). with some of the help of mimes and white mages, omega mk'II will be dead in no time. He is harder. You can use a very similar strategy with Omega, but since he changes his weaknesses, instead of casting an elemental spell using ! Spellblade, cast ! Flare. You still require a bit of luck, and I haven’t killed him yet with my entire party standing at the end of the battle. How can you beat omega mk'II? he's even harder than omega!!! !